Diabetes is a condition which can affect the lower limb including the foot and ankle. This is more likely to occur when blood sugar levels fluctuate greatly and cause damage to the blood vessels and nerves of the foot and ankle. When such damage occurs the foot and ankle is less able to heal from injury to the skin, soft tissue, bones or joints. Patients with vascular disease (poor blood supply or inefficient veins) can also develop problems with healing after injury. Patients with diabetes or vascular disease need to be assessed by their podiatrist at least every 12 months. 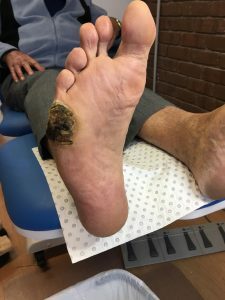 Such assessments by the podiatrist are important to prevent foot and ankle complications such as ulceration, arthritis and amputation. Adelaide Foot and Ankle provides comprehensive care through accurate and timely diagnosis that are discussed with the patient in order to develop and institute the best possible care. You may also want to visit Foot and Ankle site for other information. Copyright 2016. Adelaide Foot and Ankle. Site designed by Oceania Internet.